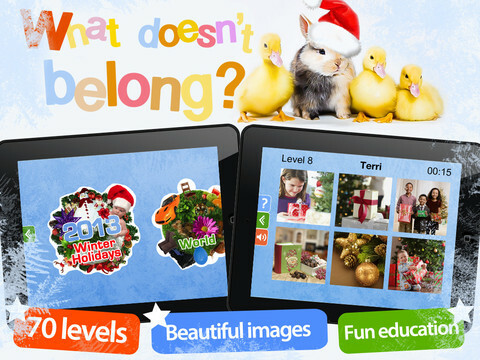 What Doesn’t Belong – Educational Brain Teaser Game for Kids – Christmas, developed by TwoTeas Applications, is an educational learning game for children. What Doesn’t Belong offers over 800 beautiful images throughout 70 different levels. 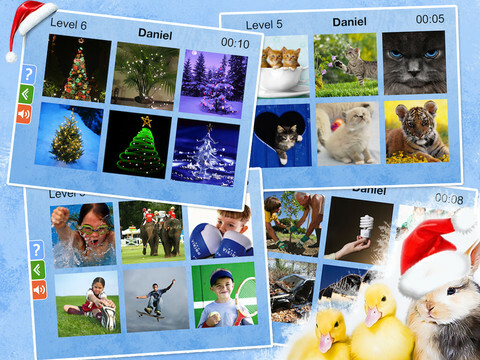 The core objective of the game is to guess which of the 6 images do not belong and explain why they don’t fit. In the process of learning your child will improve their speech and problem solving skills. You will notice that some of the levels are actually pretty tricky even for adults. Luckily they have built in hints in case you need help. The Application also has the capability to enter your child’s name so that you can view statistics and see what type of progress they have made. If you are looking for some games for your child to play on the iPad or iPhone, What Doesn’t Belong is a great choice. It is FREE, FUN, and helps develop many different skills. The Christmas Edition of “What Doesn’t Belong?” is available for FREE from the Apple App Store, so grab your copy today!